Clayton Thorson walks off the field after getting hurt. Although the redshirt freshman quarterback missed the majority of Saturday’s win over Penn State, he is expected to be ready to play in the team’s next game against Purdue. Wildcats fans can breathe a sigh of relief: Redshirt freshman quarterback Clayton Thorson is healthy and ready for Saturday’s contest against Purdue. 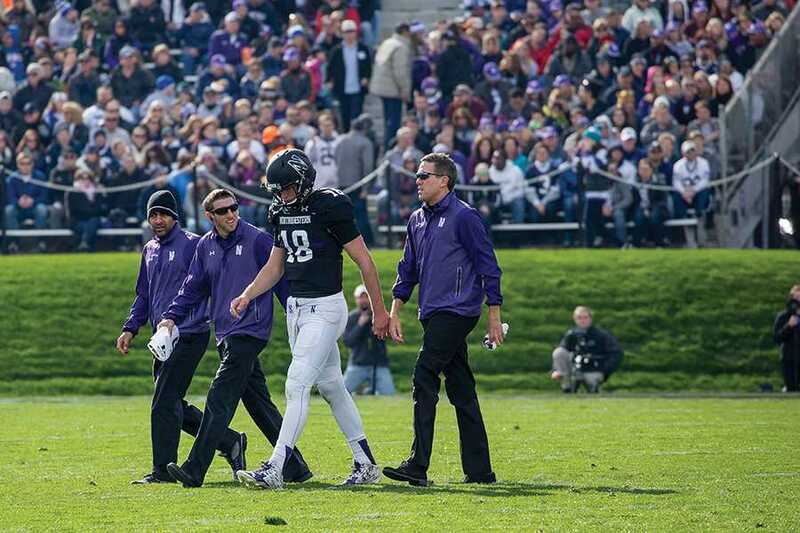 “He’s doing fine and we expect him to play,” coach Pat Fitzgerald said Monday. Northwestern underwent quite the scare when its young signal-caller limped into the locker room. But despite his early struggles, senior quarterback Zack Oliver delivered on the final drive, particularly on a clutch 23 yard throw to junior wide receiver Austin Carr. Oliver’s resilience has been characteristic of the team as a whole. After tough losses against Michigan and Iowa, the Cats rebounded with two close Big Ten wins. According to Fitzgerald, the leadership of the seniors, particularly a players-only meeting following the Iowa game, has been a big factor in putting the Cats back on track. Another huge factor is the resurgence of running back Justin Jackson and the NU run game. Although he was held to just 40 yards against Nebraska, Jackson and the Cats’ offensive line showed up in a big way against Penn State’s heralded defensive line. Another factor in the running game’s improvement has been Thorson’s increasing involvement in the running game. After making several explosive plays against Nebraska, Thorson continued to be successful against Penn State but did suffer some big hits in the process. Fitzgerald said he is looking for Thorson to start sliding or heading to the sideline more than he has as of late, specifically citing a play in the first quarter in which Thorson took a big hit and fumbled. Fitzgerald also addressed other injury situations around the team. Junior linebacker Jaylen Prater, who left Saturday’s game on the first play from scrimmage, is considered out for the moment, with senior guard Geoff Mogus being given the same distinction. Fitzgerald also discussed the play of freshman linebacker Nate Hall, who stepped up in Prater’s absence. While the Cats are focused on Purdue, and as always, going 1-0 this week, they aren’t shying away from thinking big picture. Heading into the final three weeks of their season, the Cats do have some long term goals in mind. For seniors such as cornerback Nick VanHoose and guard Matt Frazier, the end of the season also means the end of their NU careers. Meanwhile, VanHoose said while he is focused on the present, he wants to finish his senior season on a high note by winning out the rest of the season and being a part of the first Northwestern team to win 11 games. But it is not just success that VanHoose is talking about. He also spoke on how quickly his time at NU has gone and what it will be like to play with his teammates at home one last time.